Meets FDA and California proposition 65 requirements. The Adam and Eve design is a pure minimalist approach to the male and female forms. It is functional and makes a contemporary sculptural addition to any space. 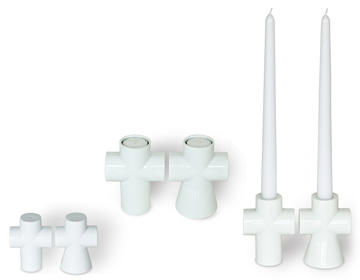 The design includes: Salt & Pepper Shakers, Taper Candle Holders and Votive/Tealight Candle Holders. Made of Porcelain, dishwasher safe.